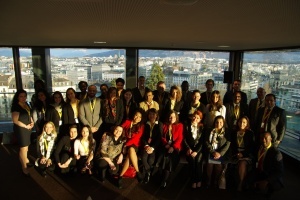 WCF-Global’s Ninth Annual Edition took place in Geneva, on 21-22 March 2018, bringing together a large number of participants who represented 25 countries worldwide! The largest delegations were from the USA and Switzerland, followed by Russia, Bulgaria, Turkey, India, Brazil, UK, Hungary, Egypt, Germany, France, Belgium, Malaysia, South Africa, China, Croatia, Denmark, Sweden, Kazakhstan, Serbia, and – for the first time, there were also experts from – Monaco, Sri Lanka, UAE and the Philippines! The first forum day featured hot content in 5 panels and 3 keynotes, while the second one brought a lot of joy for the happy winners of the prestigious global annual C4F Awards, presenting also to the forum audience 4 remarkable corporate showcases and 3 outstanding talks shared by the winners and some of the short-listed finalists of the awards. The next panel featured WCF's hosting partner - EU Business School, offering a hyper-interactive discussion on the mission, requirements and values of the new generations of young leaders - open mind, flexibility, ability to adapt to the world, vision and will to shape the future, inspiration to others, ability to uplift and support the team, creativity, problem solving, continuous improvements, risk taking, adaptation to change, ability to see and seize the opportunity when it is there, insight on technology and its most reasonable and safe use, and also - solidarity! The slot featured five impressive students with outstanding rhetoric skills, who demonstrated well-mastered public speaking manner, decision-making, problem-solving and proved that the future of leadership in business and diplomacy belongs to the well-prepared, gifted and self-confident young people! Their advocacy in favour of talent, tolerance and multi-cultured nationals was later-on reinforced in the keynote of Dr. Jon-Hans Coetzer, Chief Academic Officer, EU Business School Group in Geneva, whose message echoed in the conference hall: "None of your employees woks just for a salary - engage them creatively! We should shake off our outdated ability to judge, jaw or criticise... and try to embrace the future!" • Country reputation and online branding are intrinsically linked today. • "Culture, as the true brand of a nation, lies at the core of UAE's national identity", shared Her Excellency, Noura bint Mohammed Al Kaabi, Minister of Culture and Knowledge Development of the UAE. • "Global reputation = national brand. Be different, be reachable and predictable, offer high-quality products, be trendy in terms of technology, secure unforgettable experiences and fame will follow. Today, Turkey is much more than its food and the Turkish kebab - come visit and see for yourself!" - invited the audience Metehan Demir, Journalist, Turkey Promotion Group Communication Consultant. • "A country's reputation precedes and influences its companies' reputation, but a country does not have ONE reputation only. China wants to be welcomed overseas, yet it is much less welcoming at home, for example. Reputation lies in the visitor's perception of reality and is based on 3 key factors: environment, economy, governance. On the other hand, the strongest impact on country reputation is made by its companies' corporate reputation." - advised Diego Gilardoni, Global Business and Communication Consultant, and Author from Switzerlnad. • Yogesh Joshi, President of the Association for Business Communicators in India, presented his country in a two-minute video focused on the historical presentation of India's top contributions to the world, thus emphasising the crucial importance of knowledge, inventions, science, discoveries, latest innovations and traditional crafts and masterpieces, which also form a major part of a country's brand, image and reputation abroad. The next panel focused on the debate: Is PR dead or not? • "PR today is about analysing the audiences' behaviour. Above anything else - be Transparent. Audiences have learned to choose what they want to hear or see - they are in the driver's seat! Hence, PR today must: Do innovative campaigns, Cluster stakeholders according to behaviour and trends, Stay up to date, be Real & Transparent! What is common among PR practitioners is that we fight, for a better world - we are all warriors. Either fight the change and continue defending your values, or go with the flow and move faster - both ways serve to make PR stronger than ever!" - shared Halim Abou Seif from RADA Research & PR (Egypt,) and added: "We are here, at #WCFGeneva, for a 3rd year, cause we have become a Family, where each one learns something new, valuable and useful - let's keep that!" The second day of the WCF-Global featured amazing show-cases by winners and short-listed finalists of the prestigious C4F awards, as well as two keynote talks: one of the talks shared valuable insight on the effects of Artificial Intelligence on content marketing, and the other revealed valuable advice on how to help the developing countries improve their national-risk-and-crisis management. * The WCF-Geneva'2018 summary was prepared by Valentina Atanasova, Project Manager of the WCF-Global forum.